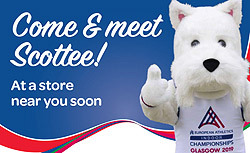 As part of SPAR’s athletics sponsorship, and ahead of the 2019 European Athletics Indoor Championships taking place from 1st – 3rd March at Glasgow’s Emirates Arena, SPAR Scotland is thrilled to announce exclusive store visits by ‘Scottee’, the Scottie dog! Scottee, the Scottie dog was revealed as official mascot for the Glasgow 2019 European Athletics Indoor Championships and will visit six SPAR stores during February to promote this prestigious athletics event taking place in Glasgow from 1-3 March. CJ Lang and Son Limited Marketing Manager Paula Middleton said: “We are so excited to have Scottee visit our stores to promote the European indoor athletics event. “We are passionate in our commitment to European indoor athletics and SPAR as principal sponsor. “Scottee will be made very welcome in our SPAR stores,” she added. Scottee will be on hand to give out goody bags for adults and children on selected days with a face painter and other fun activities taking place at selected SPAR stores. SPAR is principal sponsor of European Athletics and has been since 1996.